(1) Tennis wins its second straight national title by upsetting top-ranked Amherst in the national championship. (2) Crew wins an unprecedented FOURTH straight national title in dominating fashion — consequently, the seniors graduate without ever smelling second place. (3) Volleyball overcomes a rough start to the season with a dramatic run in both the NESCAC and NCAA tourneys, beating Amherst for the NESCAC championship and later trumping Wellesley to clinch a spot in the Elite Eight. (4) Lacrosse makes a Cinderella run through the NESCAC tourney, stunning top seed Tufts before narrowly losing in the conference championship game, making its first NCAA tourney since 2003 in the process. (5) Soccer captures the NESCAC Championship for the second straight year with a dramatic, come-from-behind overtime win over Amherst, wrapping up two straight years of undefeated NESCAC play, and advances to the Final Four for the second time in its history. (6) Cross country has its best season since 2005, finishing third at the NCAA tourney. (7) An incredible three Ephwomen (Lauren Sinnenberg ’10, Logan Todhunter ’12, Joey Lye ’09) are featured in Sports Illustrated’s Faces in the Crowd. One other current Ephwoman (Amanda Nicholson ’09) was previously featured in that section. (8) Swimming has its usual strong year, finishing fourth nationally. (9) Highlighting many notable individual accomplishments, Lauren Philbrook won the national championship in the 10,000 meters among other impressive finishes in cross country and indoor and outdoor track, Joey Lye set a variety of records for women’s softball en route to earning conference player of the year honors, and Logan Todhunter (only a first year) had a record-shattering year in women’s swimming. Just an astounding body of work viewed in the aggregate. Congrats to all. Early prediction: while it will be hard for the women to EVER top this year, next year the Ephmen are inspired to respond in huge fashion by raising their game with (a) another big year from wrestling, (b) at least one national top-three finish (cross country and tennis are top candidates), (c) at least two sports that missed the tourney returning to the NCAA’s (soccer, golf, basketball, baseball, lacrosse, and hockey are all strong candidates to improve), and (d) at least one surprise NESCAC title from a team that hasn’t won in several years. *Wrestling is the lone exception as the men’s team that exceeded both expectations and its historical performance levels. Watch the NCAA Women’s Rowing Championships here. The Grand Final, which will feature two Williams boats, is scheduled to start at 11:30 AM. The Eph Varsity 1 boat cruised to a Heat 1 victory this morning to advance directly to the Grand Final tomorrow morning. The Eph margin of victory was 17.90 seconds as they crossed the finish line in 7:04.30, beating second place Smith (7:22.20). NESCAC showed its rowing excellence as Bates 1V won the second heat (7:06.09) and Trinity 1 beat Ithaca 1V with a time of 6:58.10 in advancing to the Grand Final. 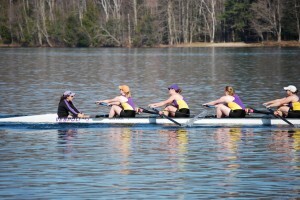 The Eph 2V came in third in Heat 3 in a time of 7:10.40 to earn a spot in the Grand Qualifier at 2:45 PM today. Joining the Eph 2V boat in the Grand Qualifier will be Smith 1V, St. Lawrence 1V, Puget Sound 1V, Trinity 2V and Ithaca 1V. The top three finishers in the Grand Qualifier advance to the Grand Final and the boats finishing 4th through 6th will enter the Petitie Qualifier. Of the six boats entering the Grand Qualifier the Eph 2V posted the second fastest time in the morning with only Ithaca 1V finishing with a faster time (7:02.70). In the afternoon Grand Qualifier, the 2V won in a time of 6:46.27, over a full second ahead of runner-up Ithaca, which was winning after the first 500 meters. Scoring for the NCAA Rowing championships is baed on the finish of both boats and it is most advantageous to place two boats in the Grand Final and the Eph 2V boat will be aiming to make the Grand Final with a top three finish this afternoon. Saturday’s schedule features the Third Final for teams that finished 13-16 on Friday at 11:00 AM. The Petite Final comprised of boats finishing 7-12 on Friday will start at 11:15. The Grand Final featuring the top six boats from Friday will go off at 11:30. The Division III Awards Ceremony is scheduled to begin at 12:00 PM. Erin Burnett ’98 asks if we taxpayers are ever going to get back the money that we have “invested” in GM? Answer: No. Full analysis here. UPDATE: Why doesn’t the embedded video that I have inserted in the post (but which you can’t see the code for unless you are an EphBlog administrator and click the edit button) work? I don’t know. When I click through to the original web page, the CNBC video plays fine for me. If you’re having problems with loading ephblog, email me at ronitb@gmail.com with a description of the problem, the exact browser and the version of the browser you’re using, your operating system, and a screenshot if possible. Also, if everything seems to be working fine for you, it would be super if you could let me know that in the comments thread below (again, with browser and OS info). Thanks. PS: here are some other eph blogs you can read while we fix things around here. UPDATE: feeds are back. Is anyone having problems now? UPDATE: I added more info and bumped this up. Informed commentary welcome. Should I be surprised that the Alumni Directory knows the date and location of my wedding? In response to some of the comments below, I did send in a wedding photo which reported the date and location of my wedding. Impressive if the Alumni Office recorded and kept track of that information! But those of us who have dealt with the Alumni Office on technology issues would be, uh, surprised by that. Just as a cross-check, here is the info for the first three graduates from the 60’s with last name Jones as listed in the directory. 1) Obviously, I will not be reporting anyone’s name or other identifying information. I just wanted to provide a (random?) sample of the data that any other alum could replicate if she wanted. 2) First three Jones from the 60’s is not the world’s greatest sampling plan, but it will do for my point. 3) The third marriage could have easily entered the database via a self-report. And kudos on the choice of Bermuda for marriage location. Very pretty! 4) But just how did the first two marriages end up in the database? I honestly don’t know. 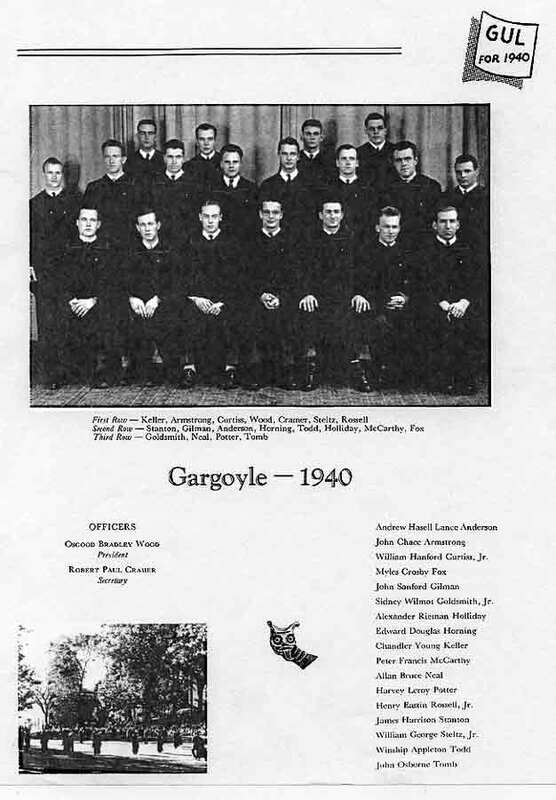 Perhaps the College saved the paper report that was submitted along with any pictures from the 60’s and then entered that data by hand when the alumni database was computerized 20+ years after those weddings. Perhaps the College surveyed for that information during a 25th reunion. The first seems to me impossible and the second doubtful. My guess is that the College has contracted with a firm that provides this sort of data for a fee. Not that there is anything wrong with that! Marriages are a matter of public record in the US. Someone has already gone to the trouble of computerizing them. Want to write an amazing senior thesis in economics or political science next year? Tell the story of the Chrysler bankruptcy. Start with the Wall Street Journal. President Barack Obama’s auto task force heard a blunt message early this spring from J.P. Morgan Chase & Co., the largest lender to Chrysler LLC. In any deal to remake the troubled auto maker, Chrysler would have to repay its lenders all $6.9 billion it owed. “And not a penny less,” said James B. Lee Jr., vice chairman at the bank, in a call to auto task-force boss Steven Rattner on March 29. The next day, Mr. Obama called the banker’s bluff. The president stepped before a podium to announce that Chrysler could face a disorderly bankruptcy or even liquidation. His meaning was clear: If that happened, the lenders would get nowhere near $6.9 billion. A few hours later, Mr. Lee called Mr. Rattner back. “We need to talk,” he said. Indeed. 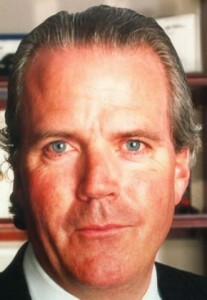 That’s Jimmy Lee ’75, subject of several EphBlog posts and most successful Eph banker of his generation. He and his wife Elizabeth (also class of 1975) donated enough money to get their name on a plaque at the Paresky snackbar. Further discussion below. Where else can one have a water balloon fight, patrol for bears, engage in random library hook-ups, debate the meaning of a liberal education, and of course, play trivia all night, all while you SHOULD be studying for final exams? The University of Michigan has 26 varsity sports (including cheerleading); Duke has about 22. So how much sense does it make for a tiny liberal-arts college to support 32 varsity teams? 1) Gadfly ought to join us as an anonymous author. His/her point of view is not well-represented at EphBlog. 2) Although there might come a time when sports need to be cut, there is at least $10 million of cuts that ought to come first. Trim that spending and then we can talk. 3) Gadfly’s opinion is not unusual among Williams faculty. I have had at least two faculty members rail against the stupidity of the Directors Cup to me in person in just the last 6 months. All those who attack me for the cuts I want to make should recognize that, if we don’t make those cuts, there will not be 32 varsity sports at Williams for many more years. 4) I am pro-athlete (and anti-tip). I would like to see Williams have even more teams, especially things like JV lacrosse/baseball and freshmen soccer. There are hundreds of Ephs who would like to play for Williams. There more that they have the chance to, the better. Moreover, the mission of Williams is to be the best college in the world, and that implies that the students here should have a better experience at Williams than they would have had elsewhere. And sports are a critical part of that experience. Don’t believe me? Ask the women on the crew team. They will tell you that their Williams experience would have been much worse without crew. When I came to the Pine Ridge Reservation two years ago, most of my students hadn’t ever finished a book. It wasn’t that books were too hard; most had never tried to finish a book. Their teachers hadn’t pushed them, and there weren’t many books to read even if they had. And that’s where ephblog stepped in. In under six months, I have received box after box of books from ephs and friends of ephs–roughly 2,000 books in total! I started with three bookshelves and now I have nine. By the end of the summer I will have eleven. What was once an afterthought of a classroom library has become the most frequented library of any sort for at least thirty miles. While I sadly won’t be returning to Crazy Horse next year–I will be going to law school in the fall–our books will be back, and I know that students and community members in Wanblee will be reading from this library for many years to come. One student asked me if she could be the librarian when I was gone. Another has been looking up quotes about reading and writing them on sentence strips to hang above the library [see picture below]. One of my older students got so excited by the book drive that she wrote her relatives in Oklahoma who donated ~50 books in a mini book drive all of her own doing! I know that when I leave, my students will be in the right place–hooked on reading with enough great books to last for years. As an English teacher and an English major, I am rarely at a loss for words. However, I really can’t begin to express my gratitude for the generosity shown by so many of you. Thank you to everyone who helped organize this book drive, and to everyone who donated books. Your books will continue to serve this community for years and years to come. The Washington Post has a good tribute. I noticed that Williams has a “Williams in Africa Initiative” meant to make the College more aware of issues in Africa. In my college search, it is rare that a school has a program so devoted to one part of the world. As a student concerned about genocide and international development, it impresses me that Williams has a strong focus on Africa. Anybody have any thoughts or know more information about Williams in Africa Initiative? I was talking with a current Williams parent yesterday. She came over to thank me for the alumni-sponsored internships. (I told her, of course, that they were a joint effort by a lot of classes.) Her son was awarded one for this summer, and that $400 a week is going to allow him to undertake a project that should make a big difference when he applies to graduate school in the fall. He’ll be working on the side in a paid (non-career track) weekend job but he couldn’t get in enough hours doing that alone to contribute his part of what the family needs to make the bottom line of that last year of Williams. The student has done very well at Williams and his family thinks that, with this internship project, he should stand in good stead of getting scholarship money for grad school. 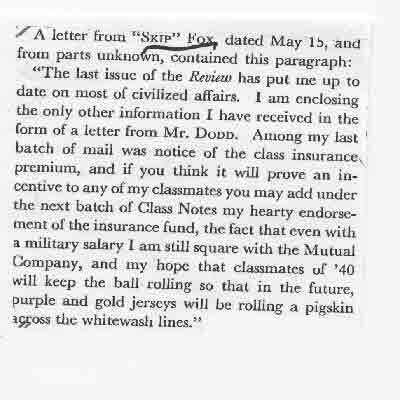 What his mother said made me very glad that my class had decided to give reunion class money to help endow the alumni-sponsored internship project several years ago. As far as I can tell, there are very few paying summer jobs out there compared to prior years. What work is there often goes to laid-off older people or, in specialized fields, to graduate students rather than college students. On the internship front, you’d be wrong if you thought people were falling all over themselves to hire unpaid interns. With severe budget and/or staffing cutbacks, many non-profits don’t have the staff to supervise interns and devise helpful, meaningful projects for them to do, and there is a general understanding that even unpaid bodies raise operating costs (lights, copying, use of telephones, etc.). Even where there still are good internships, families are finding it harder and harder to cover the costs of supporting the children over the summer plus paying all those extra bills even students on full financial aid must meet. If you work for or are involved with a non-profit, is there some meaningful work, even part-time and unpaid, that you could make into an internship that could at least provide skills, helpful contacts, and a rewarding experience for an Eph? And could you take that student into your home, water your soup a bit, and feed her or him, in return for all the joy a college student can bring into a family? Could you provide some paid work around the house (child care, sports lessons, tutoring, painting, gardening, running errands, companionship for an elderly family member…) to help a student underwrite an unpaid internship or part-time paid work? And if you work in or run a for-profit business, is there some sort of meaningful work, even part-time, you could hire a college student to do? It’s very late in the season for this summer, but, if you know of anything, please contact the Williams Office of Career Counseling, talk to current Williams families you know, or figure out how to have an announcement posted on WSO. I can’t really help this summer, but we are planning things in the hope of being able to offer housing and some paid weekend work to one or two students working in marine biology or ecology two summers from now when we again have a spare bedroom. If you, too, can’t help this summer, maybe you can start planning something for next summer. And if you are involved in a regional alumni association, maybe you can figure out a way to collect up housing and job offers (including one-time “extra cash” jobs like tending bar for a party or moving some furniture) and get them out to current students. Let’s double our efforts to help our younger brother and sister Ephs. Is Henry Silverman ’61 the real artist of the deal? Nonetheless, the hotel, real estate, and rental-car empire Silverman is building seems bound to make him a far more important dealmaker than Trump. Already, he owns the rights to such powerhouse brands as Howard Johnson, Days Inn, and Ramada in hotels; Century 21, ERA, and Coldwell Banker in real estate; and Avis in rental cars. With his $1.7 billion purchase of PHH Corp., announced on Nov. 11, he’ll add a topflight corporate relocation, mortgage, and car-fleet management company. The deal will bring to about $5.1 billion the value of acquisitions he has made since mid-1990. Finance, like love, is a timeless story because the characters and scenes repeat endlessly through history. Was this article written today or yesterday or decades ago? May the wind be in their sails and all their hand-offs perfectly efficient. And congratulations to the Williams spring NESCAC All-Academic honorees. And to the ten Williams NESCAC sportsmanship honorees. Esquire presents (pdf) 75 Movies Every Man Should See. Vaguely amusing, especially the one sentence summaries, e.g. The Warriors: Bloodthirsty mimes, clown-faced baseballers, and barechested men in leather vests—kind of makes you miss pre-Giuliani New York City. Glengarry Glen Ross: Because no matter what line of work you’re in, first prize is a Cadillac, second prize is a set of steak knives, third prize is you’re fired. The Graduate: Going home to live with your parents after graduation has its advantages. The Human Stain: Why couldn’t Nigaleian have featured such a surprising ending? Williams College senior Lauren Philbrook had the last event of the first day of the 2009 NCAA Div. III Outdoor Track & Field Championship Meet and she made it count, running to a national title in the 10,000-meter race. Philbrook came into the event seeded first and lived up to that billing, setting a Don Drumm Stadium — the home track of host Marietta College — record with a time of 35 minutes, 24.78 seconds. Philbrook’s time was nearly 24 full seconds ahead of runner-up Stephanie McNamara of Tufts University, who finished second with a time of 35:46.62. Philbrook’s time broke the old stadium record by over three minutes. The finish by Philbrook allowed the Ephs to finish Day 1 at nationals in a tie for third place with 10 points. UPDATE: The Ephs storm it, coming from behind to present Coach Alison Swain ’11 with another National Championship. Congratulations on a well-played, tough contest (made even sweeter by taking revenge on the Jeffs for winning the NESCAC title). Good luck to the woman’s tennis team, who face Amherst in Georgia today for the NCAA Division III championship. Led by Williams’s own Alison Swain ’01 (pictured above), who co-captained the team to its first national championship in 2001 and coached the Eph players to the 2008 championship in her first year at the helm, second-ranked Williams is looking for revenge against a top-ranked Amherst team that has beaten them in two of their three encounters this year, denying the Ephs the NESCAC title. The match begins at 1 P.M. The weather is unsettled: overcast with the chance of rain increasing and temperatures starting in the 70s with the heat expected to rise until cooled by rains. 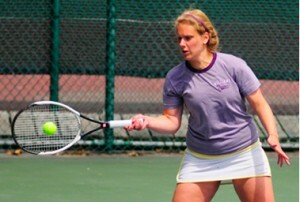 The Ephs had a relatively easy semifinal against Emory yesterday morning. Chicago gave Amherst a tough fight in the afternoon. If anyone finds a way to follow the match, please let us know. Is there anyone down there who could tweet about it? In the Purple Valley, we are almost all foreigners. Most of us can leave if need be, and we are taken care of in the pursuit of our studies. Our status – Williams student – gives us huge power on this campus. The reality, though, is that the real world is not so accommodating. Injustice happens, war breaks families, and over 15,000 children die every day from hunger (1), (2). In this context, trayless dining tends to diminish a bit, along with many of the concerns that this blog spends so much time discussing. Yet these issues do matter, and in fact matter immensely to us. I took PSYC 101 this semester, and we went over how much material goods and conditions change a person’s happiness. In the short run, people are more happy – I can personally attest to what a three year euphoria feels like. But in the long run, everyone returns to the mean. This means, I think, that because our conditions are so good, small problems become inflated in our eyes. A long line at Snack Bar here might be equal in some fashion to a much worse problem in a place of true strife. Because let’s face it: a debate over how best to allocate housing doesn’t really compare to problems in a country with hyper-inflation under a dictator. However, objectively knowing that something isn’t a big problem in worldwide context doesn’t change how much it does matter to some people. We do have the luxury of guilt, and can devote time and resources to all sorts of minor problems. I didn’t actually need to spend any money to throw an election event in Goodrich last November, but I was able and encouraged to do so. Is the fact that people care about these problems enough of a reason to think about them? How should we decide where and how to devote our attention? The women’s defending National Champion tennis team takes on Emory in Atlanta in an NCAA DIII semifinal that starts at 9 AM. At 2 PM, the number-one ranked Amherst team will make its bid for the final in the other semi-final. It’s overcast and about 60 degrees now in Atlanta, with the temperature expected to reach a high of 76 later, so the weather shouldn’t be too hard on the northern teams. Our women have a tough job on their hands, especially in the midst of a hometown Emory crowd, but let’s hope their victory yesterday, pulling it out from the clutch, inspires them to great things. Go Ephs! Here’s an article about yesterday’s competition, highlighting cool closer Nikki Reich ’11 (pictured above; photo copyright Williams College). Go Ephs! Juliana Stone ’12 wraps up the year with a couple of great columns. Go read them. I think I have swine flu. I called my radiologist dad at Torrance Memorial Medical Center seven times the other day to tell him I thought I had swine flu and to make him explain how he knew I didn’t have swine flu, and what would happen to me if I did have swine flu and it went undiagnosed. He told me to stop calling. I went to the campus health center recently because I actually was sick, and the nurses did a strep culture. But they wouldn’t test me for swine flu – even though I’d diagnosed myself online – because I didn’t have a fever. Or any of the other symptoms. And they probably didn’t want to encourage my totally out-of-control hypochondriacal tendencies. They told me to stop going on WebMD. But the administration, dining services, all of the custodians and everyone else at school are making such an extraordinary effort to take care of us. There are automatic Purell hand-sanitizer dispensers every 2 1/2 feet on campus, and I think the custodians are wiping down all of the door handles every five minutes. All of the dining halls have completely changed from buffet-style – where everyone touches everything and gets germs everywhere – to having the always-gloved dining services staff basically do everything for us. And even when I bug them for an extra spoon, or have them scramble my eggs separately because I don’t want cheese in them, or ask for half a pack of Splenda and just a little bit of nonfat milk in my coffee – because we’re not even allowed to do that ourselves – they’re friendly and helpful and never annoyed. Maybe it’s because it’s finally beautiful and warm and New England spring-y outside, or maybe because the year has been so long that we’ve all just decided that we’re already done. Which we’re not. My mom keeps reminding me. And I still need to pack up my room into boxes and ship everything home. It’s going to be a nightmare. I have to schlep the 1 1/2 minutes to the post office and get a million boxes because I fit more junk into my room – and I have more clothes in my “closet” that I never wore. It’s gross. I need to start putting things into boxes just so I can navigate the floor again. That’s going to seem so weirdly final, I think. And even though I feel totally ready to be done with my freshman year and start all my fantastic summer stuff, I still can’t believe I’m actually going to be. In like a week. Sometimes I still feel like I should be taking my practice SATs – and that someone who’s going to be a sophomore in college still seems too old to be me. But I’m almost done. It was kind of weird having my last classes recently. I almost cried and told my history teacher that I loved him, but I thought that would weird him out. I’m going to his office hours to discuss my final paper later, though. I’ll tell him then. EphBlog is powered by WordPress and delivered to you in 1.508 seconds using 56 queries..